Metal tracks for heavy tanks KV1, KV-2, 700mm. Masterclub from Russia continues to cover popular subjects and this time we have a 700mm tracks for KV-1 and KV-2 tanks. 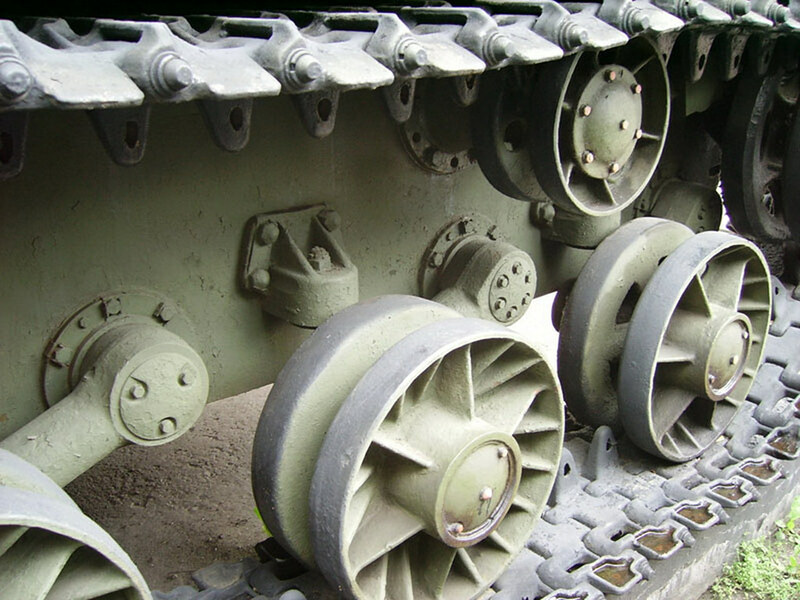 This was the most common type of the tracks that was installed on these heavy tanks and you can install them on a mode from any manufacturer – widely available Trumpeter (and Modelist, Russian licensed copy), Tamiya or even Zvezda. The package is standard for metal tracks from Masterclub – clear plastic box with paper tray and bags with parts inside. In total there are 200 metal track links and 400 resin pins. The latter are separated into other small bags depicting track pin end with flat head and the outer end with large bolt. They are also cast in different colour so that there is no confusion during the assembly. The casting is sharp and all detail of original 700mm stamped tracks with guide horns and 2 windows for sprocket teeth is carefully replicated in miniature. The track link width measures at 20mm sharp, which is equivalent to 700mm of the original. The holes in the track links are already bored and you don’t waste time on drilling them. In my sample I couldn't find any defect track links and no clean-up was required before the assembly. The build is simple – as these are large track links with relatively big holes it is easy to align them and then insert the pins using tweezers. In total I spent roughly 40 minutes on one full track chain (85 links) and the chain is fully articulated afterwards giving perfect feeling of sag of heavy metal on the model. The original manual states that KV should have 87 links per side, but as I read on other websites this is the issue of the wheelbase on the Trumpeter kit, not the track issue. The fit to the Trumpeter sprocket was perfect and I also included 2 comparison images where you can see a difference in detail between the tracks in the box (both plastic and vinyl) and Masterclub offering. Of course I have seen models where original plastic tracks were enhanced to plausible look, but most often people replace the tracks with something else. As for comparison with other metal track manufacturers – I do not possess any sets, but from what I've seen on other examples and on the web the Masterclub offers sharper casting and more realistic detail due to resin pins. The final choice is up to modeller’s budget and preferences as well as availability of products. If you are interested in painting these tracks – my personal recommendation is to burnish assembled tracks with preferred product (Blacken it, AMMO burnisher, Quick rust, etc), then clean up the pins with isopropanol and cover the pin heads with primer using a brush. That gives bulletproof adherence of paint to pins and also protects them from any kind of weathering product influence. Just be careful not to heat the track chain to force dry paint as the resin would be deformed. Highs: accurate detail, realistic appearance. Hi Roman! "lows" the ties dont have the holes.. or almost that holes appears in this tracks of KV2... I read in some place some KV have different size of ties, but i dont not sure if that apply for every KV model. cheers.